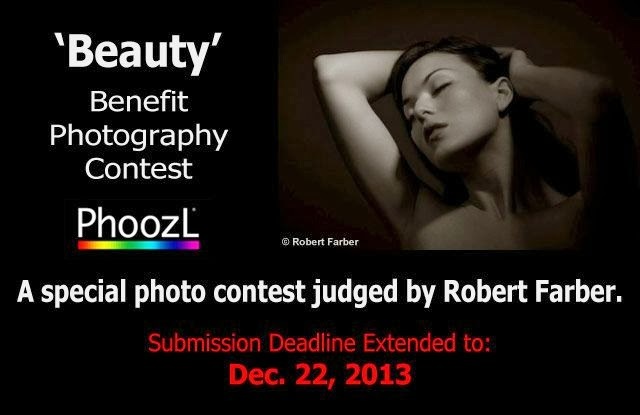 ‘Beauty’ - Benefit Photo Contest - Deadline Extended! November 25, 2013 /Photography News/ The concept of Beauty crosses over many genres in photography: portrait, still life, landscape, nature, sport, fashion, and more. But the unifying thread is the perceptual experience of pleasure, satisfaction, and emotional well-being. If “beauty is in the eye of the beholder,” what do you behold? Show us. SPECIAL NOTE: Beauty also inspires, which relates specifically to PhoozL's beneficiary/charity partner: the Josephine Herrick Project (formerly Rehabilitation Through Photography). JHP provides free programs to inspire teens, adults, and seniors with the visual language of photography. JHP will receive a significant donation (80%) from your entry proceeds. Contest prizes include: a 1:1 personal communication with judge Robert Farber about the winner’s entries or photographic work, a $500 Gift Card from online photo retailer Unique Photo, a one-year subscription to award-winning Aperture Magazine, a free book selection from the digital photography catalog of Cengage Learning PTR, custom award icons, inclusion in PhoozL’s Winners Showcase, and bonus PhoozL Points. Entrants retain copyrights in their images, and copyrights will NOT be assigned to any other party, nor are there any Contest requirements asking Entrants to waive their copyrights. Entrants grant a royalty-free, irrevocable, perpetual, worldwide, NON-exclusive license to PhoozL to reproduce and display any Entry in connection with and promotion of the Contest, including but not limited to publication highlighting Entries or Winners of the Contest. NO “rights grabbing” here! Judging/Juror: The head judge is world-renowned photographer Robert Farber.